Chile Lime Popcorn: Microwave popcorn with a hint of spice and lime. Treat your tongue to a flavor fiesta and snack on Chile Lime Popcorn. The surprising Southwest spice complements this mainstay movie munchy in a surprising way. 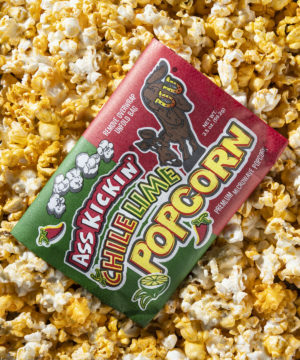 Each popped kernel maintains a light and airy texture while it is imbued with a moderate kick of spice and a hint of lime to balance out the taste. This explosion of flavor folds neatly into a convenient microwaveable bag for mess-free Mexican-inspired snacking.